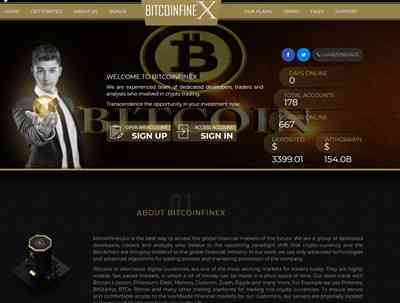 WELCOME TO BITCOINFINEX We are experienced team of dedicated developers, traders and analysts who involved in crypto trading. Transcendence the opportunity in your investment now. 04.03.18 08:46 Transfer Sent Payment: 130.00 USD to account U16774202 from U1294xxx. Batch: ‎207299843. Memo: Shopping Cart Payment. Deposit to bitcoinfinex.biz User all-hyips.info. 04.03.18 21:37;Account;Receive;Received Payment 13.00 USD from account U16774202 to account U1294000. Batch: 207361950. Memo: API Payment. Withdraw to all-hyips.info from bitcoinfinex.biz. 04.03.18 20:14;Account;Receive;Received Payment 6.72 USD from account U16774202 to account U1294000. Batch: 207356606. Memo: API Payment. Withdraw to all-hyips.info from bitcoinfinex.biz. 04.03.18 19:51;Account;Receive;Received Payment 6.00 USD from account U16774202 to account U1294000. Batch: 207355204. Memo: API Payment. Withdraw to all-hyips.info from bitcoinfinex.biz. 04.03.18 19:50;Account;Receive;Received Payment 12.00 USD from account U16774202 to account U1294000. Batch: 207355169. Memo: API Payment. Withdraw to all-hyips.info from bitcoinfinex.biz. 04.03.18 19:49;Account;Receive;Received Payment 13.00 USD from account U16774202 to account U1294000. Batch: 207355099. Memo: API Payment. Withdraw to all-hyips.info from bitcoinfinex.biz. 04.03.18 14:48;Account;Receive;Received Payment 59.7 USD from account U16774202 to account U1294000. Batch: 207330875. Memo: API Payment. Withdraw to all-hyips.info from bitcoinfinex.biz. 05.03.18 06:58;Account;Receive;Received Payment 24.1 USD from account U16774202 to account U1294000. Batch: 207388129. Memo: API Payment. Withdraw to all-hyips.info from bitcoinfinex.biz. 05.03.18 05:08;Account;Receive;Received Payment 16.00 USD from account U16774202 to account U1294000. Batch: 207381238. Memo: API Payment. Withdraw to all-hyips.info from bitcoinfinex.biz. 05.03.18 03:29;Account;Receive;Received Payment 13.00 USD from account U16774202 to account U1294000. Batch: 207376346. Memo: API Payment. Withdraw to all-hyips.info from bitcoinfinex.biz. 05.03.18 02:48;Account;Receive;Received Payment 48.3 USD from account U16774202 to account U1294000. Batch: 207374967. Memo: API Payment. Withdraw to all-hyips.info from bitcoinfinex.biz. 05.03.18 02:47;Account;Receive;Received Payment 20.00 USD from account U16774202 to account U1294000. Batch: 207374953. Memo: API Payment. Withdraw to all-hyips.info from bitcoinfinex.biz. Согласно правил форума: п. 2.4 - тема закрывается, переносится в раздел "Скам." Страница сгенерирована за 0.121 секунд. Запросов: 30.